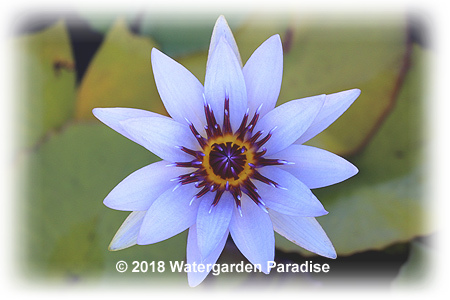 Tropical waterlilies are usually grown in the warmer climate area and requires at least 5-6 hours of sunlight per day and flowers between December and late May in Australia. There are two types: day flowering/blooming waterlilies and night flowering/blooming waterlilies. Water lilies will NOT grow well in ponds/water features where there is fast moving or splashing water on their leaves. Should given some fertiliser tablets during their growing months in Spring and Summer to encourage flowering (especially when they are growing in pots). Sold in the form of barerooted plants or sprouted corms. (NOTE: Some older/vintage cultivars and species are no longer listed for sale on our website, but are still available sometimes upon request.) Can be grown in temperate and sub-tropical areas throughout NSW, Victoria, Queensland (including tropical regions), SA, WA and NT. These the waterlilies comes in a mix of colours (white, pink, yellow & blue). They are medium to large growing waterlilies at a special price for the budget conscious buyer. Bargain Buy! All plants are named varieties selected by us at the time of packing. Excellent for landscaping if the buyer is not concerned with which variety they are provided with. Photo displayed is a guide only. Not for WA. Sold in the form of corms or plantlets of variable sizes. Whilst stocks last. Excellent for landscaping if the buyer is not concerned with particular cultivars. Photo displayed is a guide only. Not for WA. Whilst stocks last. Sold in the form of corms or plantlets of variable sizes. Colour unknown. These were originally named cultivars, but unfortunately the labels have been lost, so we are selling them at a greatly reduced price. Excellent for growing in pots if the buyer is not concerned with flower colour and is happy to grow them up from small corms. Photo displayed as a guide only. Not for WA. While stocks last. Sold in the form of small corms or plantlets.